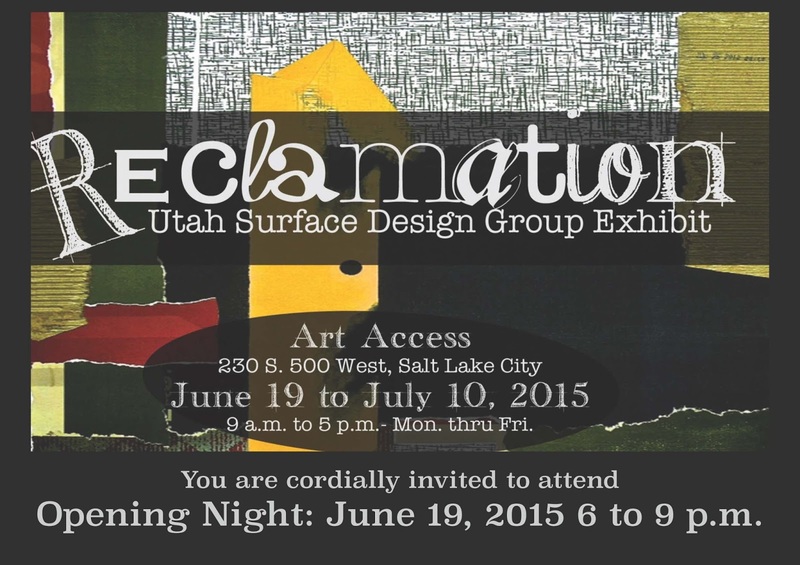 One of the projects I have been working on is co-curating an exhibit for the Utah Surface Design Group called: Reclamation. 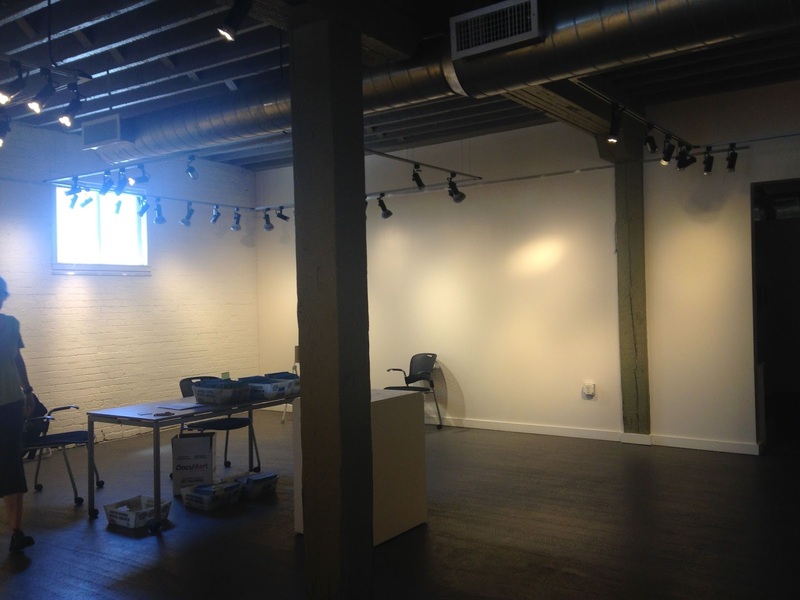 I had no idea how much work goes in to curating an exhibit when I accepted the assignment! My co-curator, Anne Munoz, and I are very grateful to everyone who has made the job easier, especially everyone at Art Access. They have been a wonderful gallery to work with! Yesterday I spent a couple of hours with the gallery executive director, Sheryl Gillilan, and Anne Munoz, getting most of the exhibit hung. Here is a before photo of the back gallery wall (there is another room behind it which will have some lovely art from another artist). I also took a panoramic before shot. In this shot I am standing up against the back wall (pictured above) near the post on the wall. The photo makes the gallery look enormous! We always do a group exhibit at our USDG shows. 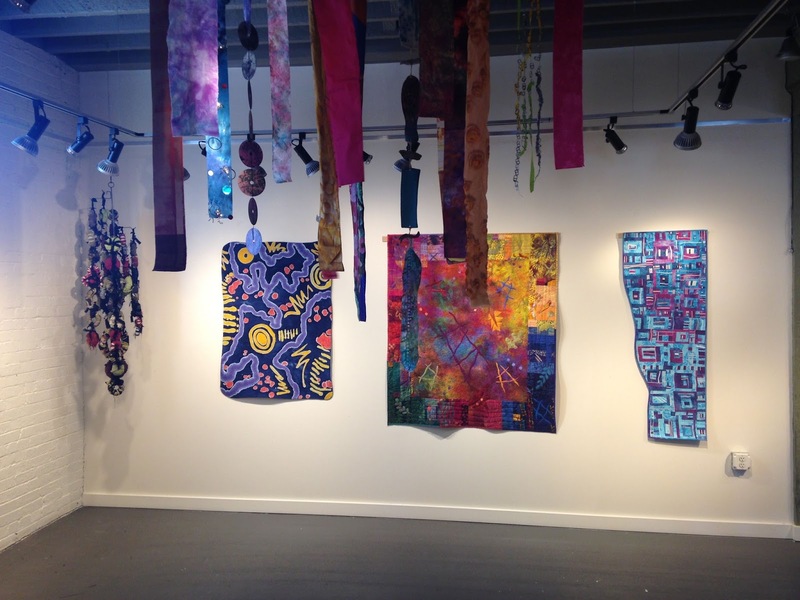 This years group exhibit are pieces that are between 3 and 6 inches wide and 6 to 9 feet long. 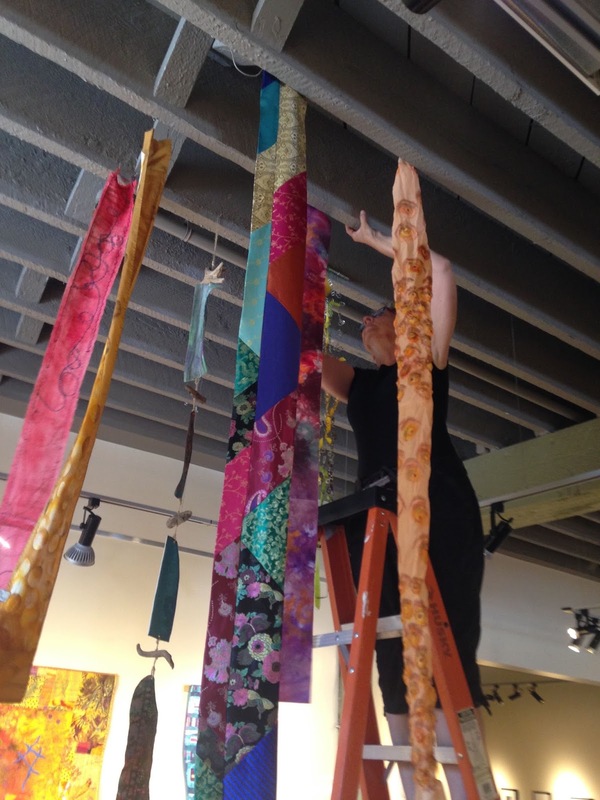 Sheryl got a good work out going up and down the ladder as we moved ladder to hang the group exhibit. We placed the pieces in front of the air conditioner to give the pieces some movement. Here is just a very small peek at the show. We have 26 artists participating and over 46 pieces of artwork on display. I hope you can join us for the opening or sometime during the three weeks the show is on display. Lisa, Looks like a great exhibit. Wish I was closer. You have been a busy bee!! Looks great! Boohoo! I don't know if I will be able to go see it in person. Oh I wish I could see this exhibit in person! it looks beautiful! congratulations! The exhibit looks beautiful! I especially like the free floating group pieces hanging from the ceiling! Wish you and the other artist success!